Azure has a bunch of built in roles but sometimes you need someone or something to be able to do a single task and don’t want to over permission their account. 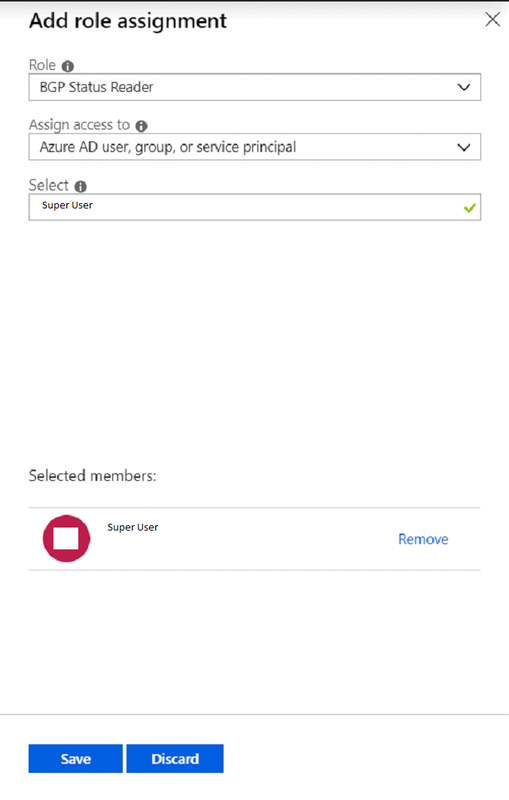 Azure RBAC allows you to define a custom role with really granular permissions. To do this you can use PowerShell to pull one of Azure’s pre-defined templates, modify it in a text editor using JSON, then push it back as a custom defined role to assign to your user. My example will be to create a user role that’s able to read BGP status information from the subscription. Initially I created a user and gave it the ‘Reader’ role but I hit the following error. Take a note of the permission (Action) required, as this will be used to create the new role definition. Check the list of RBAC roles by attempting to add role to a user on a subscription, resource group or resource in the portal. You can also run the following PowerShell command to get a list of all the resources in your subscription. Once you’ve selected a template that’s similar to what you want, then get the definition and view the current permissions. I’m just using the ‘Reader’ role as it’s really simple and I only need a couple of additional permissions. Edit the file in a text editor. You need to remove the id tag and change IsCustom to true. Change the Name, Description and add in the Actions required. And here is my custom file, note I have set this to be limited to a subscription. Also, I have modified the Action to include all actions for virtualNetworkGateways. Once you’re happy with the modifications, you can use it to create a custom role definition. You can now assign this role definition to your user account. And re-run the problematic command. If you have difficulty and need to remove your custom role, you can run the following command. Once the role is removed you can recreate it with the above commands. There is also a Set-AzureAzureRmRoleDefinition but this may require modifying your JSON.